I marvel at the power of that old chestnut about people in the middle ages believing the earth was flat. Even a person who rejects the myth that Columbus proved the earth was a sphere nevertheless trots out the poor, benighted medieval Europeans as believers in a flat earth. Consider, for example, Valerie Strauss’s post for the Washington Post: “Busting a myth about Columbus and a flat Earth.” Despite the promising title, she traffics in one of the typical versions of the flat earth myth. During the early Middle Ages, it is true that many Europeans succumbed to rumor and started believing that they lived on a flat Earth. Strauss has no excuse for making this claim. She is simply and demonstrably wrong. And she should know it. Another version of the Error is that the ancient Greeks may have known that the world was round, but the knowledge was lost (or suppressed) in medieval darkness.… Many inconsistent varieties of this version exist: The knowledge was lost in the first century A.D., or the second, or the fifth, or the sixth, or the seventh; and on the other end it was lost until the fifteenth century, or the twelfth, or the eighth. The mildest variety, therefore, posits only a few years of darkness from the flattening of the Greek earth to the rounding of the modern one. Yet Strauss seems as committed as ever to a Dark Ages model of history, complete with its flat earth fantasy. 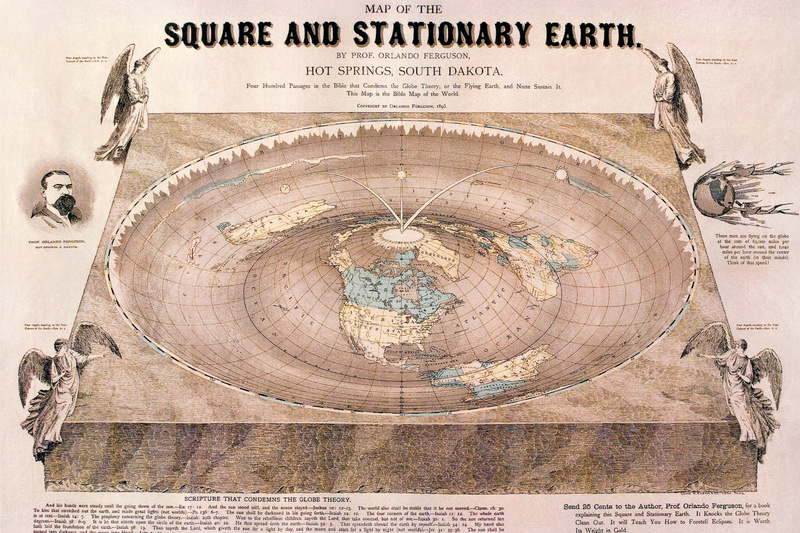 Orlando Ferguson’s amazing map of a flat earth, from 1893. First, I am particularly worried because Strauss’s myth-busting post appeared on her regular column, “The Answer Sheet,” which she characterizes as a “A school survival guide for parents (and everyone else).” How many parents and everyone else’s have read and been misinformed by Strauss’s “survival guide?” At least one other person has read, believed, and repeated Strauss’s claim about medieval Europeans thinking the earth was flat. Since Columbus owned a copy of an ancient Greek book [i.e., Ptolemy’s Geography] that outlined the reasons why the earth must be round, he did not believe that the earth was flat. So did anyone ever believe that the earth was flat? Actually, yes. During the Middle Ages in Europe, many people began to believe the rumors that the earth was actually flat. Actually, no. During the Middle Ages in Europe, almost nobody began to believe or likely even heard any rumors that the earth was actually flat. The person who runs “Today in History” claims to be “someone who love history” and is “passionate about learning” and hopes to “provide more insight into event in the past.” Alas, duped by Strauss’s “survival guide” the person who runs “Today in History” is passing on misinformation and falsehoods. On the one hand, Strauss’s post reflects willful ignorance and dogmatic rejection of evidence. On the other hand, Strauss’s post reflects historians’ failure to dispel this myth. Despite all our ranting and raving, we historians have failed to communicate with audiences, e.g., scientists, journalists and authors, politicians, educators, etc. I have fared no better in various efforts to combat this myth (some of which you can find by searching this blog for flat earth). I am going to give it another go next week, at Taste of Science Philadelphia, where I am speaking along with climate scientists at “Climate change: How we got here, and looking to the future.” Maybe lubricated with some beer and good food I’ll have better luck.